The purpose of thermal recovery of oil is to reduce its viscosity by 90 to 99.9%. There are three ways to do this. The first is to increase the gas-oil ratio (GOR). The second is to heat the oil. The third is when water dissolves in the oil at high temperature and pressure. There are two types of thermal processes, steam injection and in situ combustion to generate steam. The biggest difference between the two processes is that fuel must be burned outside the reservoir to create steam for injection and the residual oil is burned in situ to make the steam with in-situ combustion. Another major difference is that heat losses in the injection wells can cause some or most of the steam to condense before it reaches the formation. 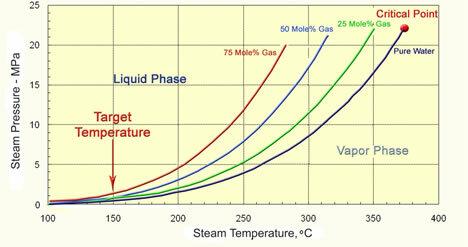 The following figure illustrates the heat loss and decrease in steam quality that is calculated to occur versus depth for 700 barrels per day of injection. Steam quality is the weight fraction of water that is in the vapor phase. This is important since water vapor contains ten times as much energy at low pressure as condensed water. The condensation of steam that transfers energy to the oil heats it and reduces its viscosity. 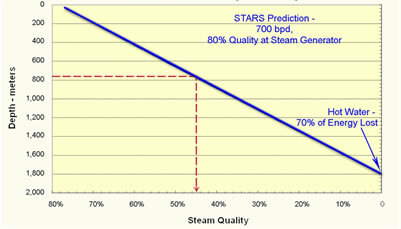 If the steam quality is below 50 percent, steam injection becomes much less effective. So, the lower limit of steam injection is often given as approximately 800 meters (2,500 feet). Below that depth in situ combustion or a down-hole steam generator are needed unless larger quantities of steam are injected. Where A and B are unique constants for each component of the oil, T is the absolute temperature and Xi is the molar concentration of the component. This equation is plotted in the next figure for very viscous oil. 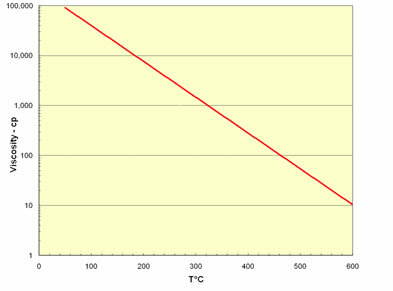 The figure shows that the temperature is decreasing exponentially, so that viscosity has decreased from 100,000 cp to 1,000 cp as the temperature rises from 50°C to 300°C. For practical purposes steam only reaches temperatures of 300°C because the steam temperature is controlled by the equilibrium partial pressure of water. The very high temperatures shown in the figure can only be reached if the water evaporates, i.e., in an in situ combustion process. Then the viscosities can decrease even more. 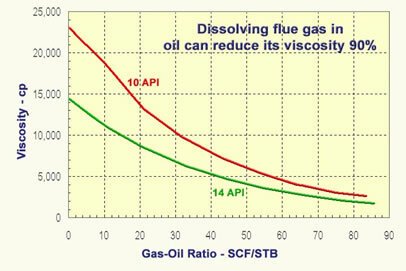 As noted above another method of reducing oil viscosity is to dissolve gas in the oil. Dissolving a significant concentration of a small, low-viscosity molecule in a mixture of molecules with a large molecular weight has a very large effect on oil viscosity. The figure below shows the effect of adding gas to dead oils with viscosities of 23,000 cp and 14,000 cp. The figure shows that flue gas dissolved in the oil at 14 MPa reduces the oil’s viscosities by 90 percent before the oil is heated. It is important to recognize that a gas moves much faster than steam because steam can only advance when the reservoir is heated to the steam temperature. So adding a gas to either steam or using high pressure in-situ combustion can both decrease the oil’s viscosity ahead of the heated zone. Gas has two effects. The first is to reduce the viscosity in the oil ahead of the steam front. 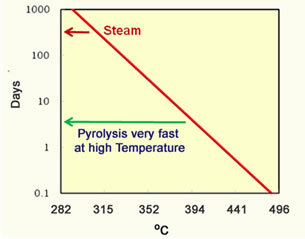 This is shown the figure below, where a region of higher GOR precedes the steam front in the simplified schematic of a high-pressure in-situ combustion process. The GOR is high when the temperature is low. Then the GOR decreases as the oil is heated until the steam zone is entered where there is little gas in the oil. The oil’s viscosity is kept low than by the high temperature. Any gas added to the steam has this effect on oil viscosity. So addition of nitrogen, CO2 of reservoir gas to steam all can accelerate oil production. The second effect of gas is shown in the third figure of the series. This figure shows that gas reduces the partial pressure of water and therefore it reduces the temperature at which steam condenses and evaporates. This means that the steam has to heat the rock less to heat oil and the steam moves into the reservoir faster. Now, if the pressure is low, the temperature of the steam is also low. The three figures suggest that gas has less of a beneficial effect at low pressure than at high pressure where gas can modify the temperature of the steam as well as dissolve in the oil to reduce its viscosity. The reaction begins to proceed quickly at temperatures above 300°C. The calculated half life of asphaltenes is presented in the graph to the left of the next figure. An asphaltene molecule is greater than a year at temperatures less than 315°C (600°F). These are temperatures observed in steam floods. Steam projects are limited to this temperature because condensed water is always present and the temperature is limited by the partial pressure of water to one of the lines on the right of the partial pressure figure above. However, all the water can evaporate in an in-situ combustion project and the temperature can easily reach 400°C (752°) where the half life can be a few days. So, more pyrolysis can occur during in-situ combustion projects than during steam projects. The graph on the right hand side of the figure shows the API gravity calculated for the oil produced from an in situ combustion project. 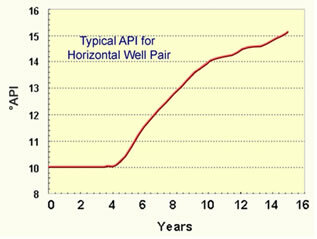 An increase of 10 to 15 API gravity is a decrease in density of the oil from 1.0 to 0.967 g/cc. The amount of sulfur in the oil is likely to also decrease.